SAN DIEGO, Calif. (CBS/KFMB) Junior Seau's friends and family gathered around him at Scripps La Jolla Hospital Monday night, giving the Former NFL star linebacker support as he recovers from injuries sustained when his SUV plunged off a cliff outside San Diego, Calif. early Monday morning - less than seven hours after he was arrested on suspicion of domestic violence. 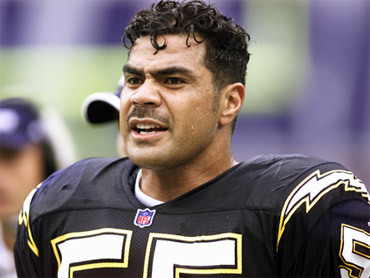 Longtime San Diego Chargers Chaplain Shawn Mitchell paid Seau a visit in his hospital room and says he enjoyed seeing him again, according to CBS affiliate KFMB. "His spirits were good," Mitchell told the station. "He's weak, he's bruised, but I've seen him worse after football games." "He's fine, he's fine," yelled out an unknown family member, seen outside the hospital. There's no word on when Seau will be released. Seau told police on the scene that he had fallen asleep at the wheel, KFMB reported. Seau's 25-year-old live-in girlfriend called 911 Sunday night to report that Seau assaulted her during an argument at his Oceanside home, according to Oceanside police. She appeared to have minor injuries and did not require medical treatment. The 41-year-old was arrested outside his home around 2 a.m., about two hours after police arrived. He wasn't home when authorities got there, but they asked him to return when he called his girlfriend. Seau posted bail and was released from the San Diego County jail in Vista at around 3:30 a.m., approximately five hours before the crash, according to police. According to Lieutenant Kelly Cain of the Carlsbad Police Department, responding officers "said they saw nothing to indicate physical symptoms of drug or alcohol impairment," KFMB reported. A toxicology screening will be complete in six weeks to rule out alcohol or drugs.